Every body tells a story. Is yours telling the one you want? “Gina is the maestro of public speaking. She coached me for my TED talk.” Susan Cain. CEO Magazine: You Can Communicate But Can You Connect? Fortune: Like, totally don't talk like this to get ahead in business? Networking Times: Is Sub-Text Dominating Your Communications? From the moment a professional stands behind a podium or at the head of a conference table you sense that speaker’s authority, passion, knowledge, confidence – or lack thereof. Immediately, you create a narrative, a story. It’s not a story about shape or size, gender or height. It’s about how that speaker lives in his body and occupies his role – how powerfully he can Play The Part. Actors master techniques that enable them to move audiences. For you the workplace is your stage and the competition can be fierce. How can you learn the skills needed to connect with clients, colleagues, and managers with clarity and composure? How can you master communication excellence and embody the story you want to convey? 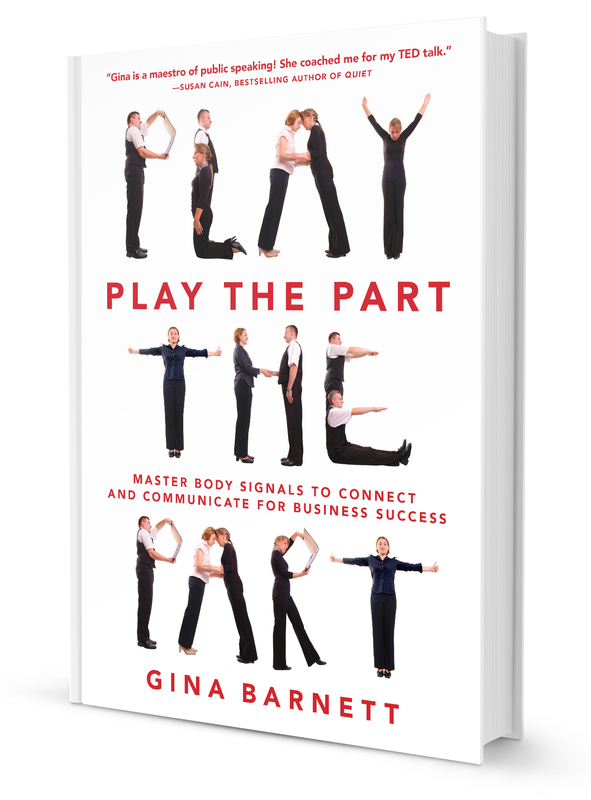 PLAY THE PART introduces professionals of all levels – from aspiring managers to CEOs – to the body as an instrument. Delving into the concept of embodiment, the book explores such things as how pace, posture, gestures, walks, and facial expression impact not only your emotions but those of your audience. Offering over one-hundred easy and playful exercises, you will discover how making the slightest physical adjustments can profoundly impact your leadership presence. We all know our emotions impact our bodies, but do you know that by just changing your body you can impact your emotions? Thoughts become manifest. Are your thoughts as habitual as your hand gestures, and are they serving you now? As the world becomes increasing virtual how do we connect across time zones and cultures? Why is the design of a presentation as important as its overall content? Why leadership presence is a skill not a mystery, and how to get it.